1. What types of sensors & switches require SoftNoze Integration Components? • Inductive Proximity Sensors available in many shapes and sizes, but all use wire winding around a ferrite core which emits a RF field from the sensing face. When metal targets approach the RF field they are detected without actual contact. Commonly applied at a range of 1mm (0.039") to 60mm (2.36"). • Capacitive Proximity Sensors many shapes and sizes, but all contain a metal plate in the sensing face. Targets often include liquids, granular materials, paper, glass and wood. The target and metal plate work together to create a capacitor and as a target moves closer, the capacitance changes until an output is generated. Effective at ranges from 1mm (0.039") to 50mm (1.96"). • Photoelectric Proximity Sensors offered in a wide variety of sensing modes and physical configurations, but all use some form of light energy to detect targets. Target materials are quite extensive and selection depends on the target's reflective properties. Models are available with sensing ranges from 1mm (0.039") up to 20 meters (65 feet). • Ultrasonic Proximity Sensors uses high frequency sound waves to detect the presence of an object. Good target materials are solids, liquids and granular media due to their high reflectivity and unlike photoelectric sensor, target color and dusty environments do not effect them. Commonly applied in applications from 60mm (2.36") to 8.0 meters (26 feet). • Machine Vision & Smart Sensors is the application of computer vision to industry and manufacturing. Whereas computer vision is mainly focused on machine-based image processing, machine vision most often requires also digital input/output devices and computer networks to control other manufacturing equipment such as robotic arms. Machine Vision is a sub-field of engineering that encompasses computer science, optics, mechanical engineering, and industrial automation. One of the most common applications of Machine Vision is the inspection of manufactured goods such as semiconductor chips, automobiles, food and pharmaceuticals. Commonly applied in applications from 60mm (2.36") to 3.0 meters (9 feet). • Limit Switches switches that operate just like an ON/OFF switch, but they are equipped with specialized rollers, levers, etc. When actuated the limit switch outputs a control signal(s). Unlike proximity sensors, limit switches must be physically contacted to operate. • Safety Switches Similar to limit switches, but safety switches have a two-part switch consisting of a 1) switch body and 2) a unique operator or "key". In order to generate an output signal(s) the unique key must engage with the switch body. Used in machinery to protect workers from unsafe access to machine areas. • LVDT provides very accurate positional feedback as a plunger physically contacts and moves against a target or work piece for measuring and gauging purposes. • Thermocouples commonly a probe-shaped device containing two dissimilar metal wires, which are used to measure temperature. • Pressure Sensors & Switches these are attached to pipes and vessels to monitor this critical condition within a process or system. 2. Industrial controls? Automation sensors? Okay, but can I see a picture to put this into perspective? Sure! 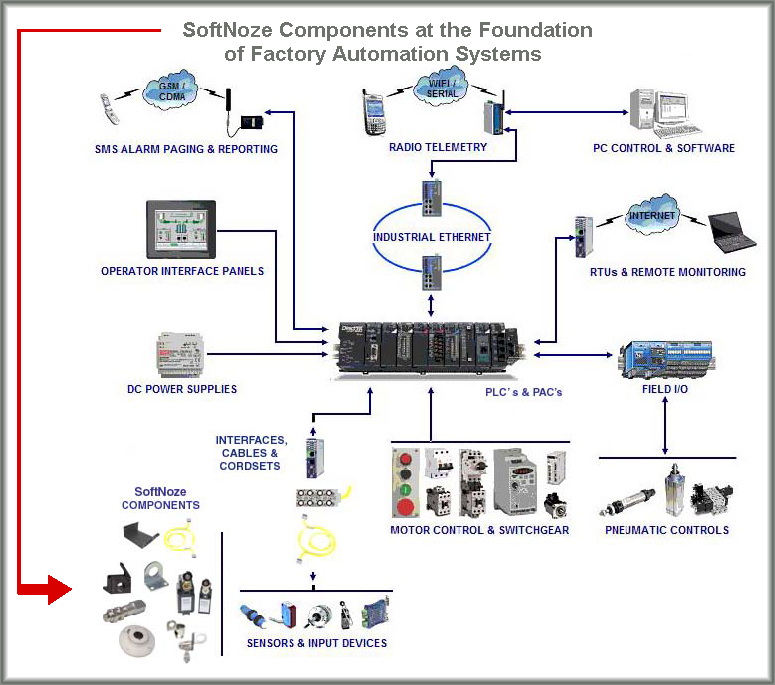 Click this link and view where SoftNoze Components are found within Automation Systems. 3. Which companies produce the sensors & switches that SoftNoze's products help integrate? Click here to see the many logos of Sensor & Switch companies that SoftNoze's Integration Components work with. 4. Need more information on these or other switches & sensors? I'm a SoftNoze Product Engineer and Sensor Integration specialist, I'll be happy to provide you with an answer I'll make it fast too! 5. Can you help me understand sensing range terms and issues? Yes, we have a basic glossary of sensor and sensor accessory/intergration terms.